Typically we think of Disney World as the happiest, greatest, most magical place on Earth, the most fun vacation EVER for our families and loved ones. 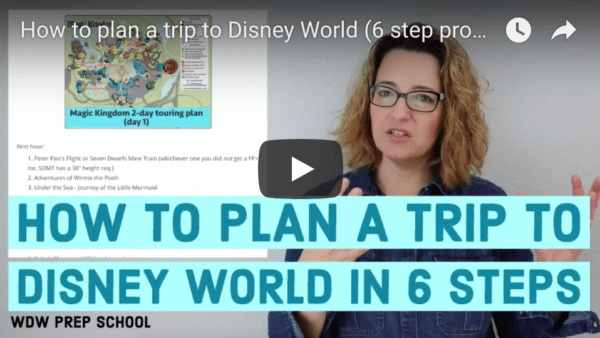 But did you ever think of taking a...field trip to Walt Disney World? I’m a middle school librarian and multicultural club sponsor, and recently led a group of 33 students, parents, and chaperones to Orlando for what can only be called...THE BEST FIELD TRIP EVER! 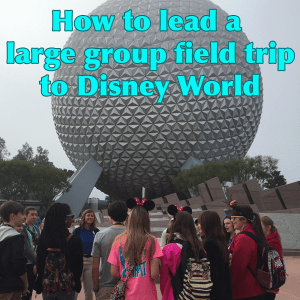 I’d like to offer advice on the steps I took to leading a group to Walt Disney World, and then tell you about how the educational programming works at the WDW. Peruse the Disney Youth programs site and choose one or more courses that would meet the specific needs of your group. For my multicultural study kids, I selected “Introduction to Global Citizenship.” I then used this program information to present my field trip idea and request to the school principal. With his approval, I proceeded with our district’s process for out-of-state field trips. I researched big Disney events (this site is very helpful for that!) to determine optimal travel dates that would not conflict with other events already on the school calendar, and surveyed group interest (spoiler alert: there will be 100% student interest in a field trip to WDW!). I surveyed interest and collected contact information with a simple Google form. Secure quotes from a Disney Youth Programming representative for hotel and park tickets. Connect with Disney Youth reps by calling 1-877-WD-YOUTH. If possible, see if your financial secretary/bookkeeper can get a Florida tax exemption certificate (those are good for five years). This will save money on hotel and park tickets! Get a quote for your preferred method of travel. If you book far enough in advance, you can get a really good rate with certain airlines. We traveled with Southwest and not only enjoyed great rates, but also received a warm welcome from the crew on our trip to Orlando. It tickled the kiddos (most of them first-time flyers) to hear our school/group name announced over the plane’s intercom. Make decisions about food provisions (whether or not to incorporate a dining plan, reservations, etc.). Using all these quotes for each service, determine the price per person and include that in addition to trip itinerary, program description, and other pertinent details in your out-of state field trip request packet. I even wrote an emergency plan for everything from the monorail to the Disney bus system. The more detailed your proposal, the more likely you are to get it approved! Once your trip is approved, confirm the quotes with your assigned Disney rep, and proceed to the Disney Youth Education Series (YES Program) site to officially register for your program and trip. Send out information to your group regarding the details of the trip (cost, dining plan options or food expenses, packing list, etc.). When your program of choice is confirmed by your Disney rep, you can move forward in purchasing a group ticket park package. Fundraise and/or collect trip fees from participants until approximately 8 weeks prior to your arrival in Orlando. Make all final payments in full by the determined pre-travel deadlines. Break students and parents into small groups, assigning them to a teacher chaperone (if you have multiple teachers). Introduce each group member to their supervising chaperone. Hold a parent meeting approximately two months before departure to review packing list, itinerary, room assignments, dress code, and to address any other concerns. Invite the school nurse to attend and review all guidelines and paperwork for traveling with medications (in my district, there is a legal process for parents signing the meds in to the school nurse, who preps them for the field trip; students may not carry their own medications). Collect copies of students’ birth certificates at this meeting, which are required by some airlines’ ticketing agents and some TSA agents when going through airport security. It is always better to have these and not need them than to need them and not have them! One week before departure, share the weather forecast with participants so they can pack adequately. Also, collect student IDs (because my middle schoolers are all ages 12-14, they do not have a valid state-issued form of identification; their school ID is acceptable for air travel). One week prior to departure, teach through the pre-trip lesson plans and activities provided by the Disney YES program. These were fun and easy, and helped the kids start thinking outside the box. They make the educational program even more valuable for the students. The day before departure: Create an expandable file for each teacher chaperone, including a list of the entire group with cell phone numbers, medical information for each student in their assigned group, medicines and documentation as assigned by the school nurse, Magical Express boarding passes for their small group, yellow Disney luggage tags (to be attached at airport IF you want Disney to bring your checked baggage to your hotel rooms), and copies of park tickets for every member of their group. I also included small baggies with the student IDs and birth certificates of the kids in that group, which we distributed before checking in for our flight and collected for safekeeping after passing through security. Another small baggie was included for each day with a mini schedule (wallet sized laminated schedule for the day). We gave our mini schedules out every morning at breakfast or the bus stop. 24 hours before your flight departs: check your group in (if flying Southwest). The earlier the check-in, the lower your boarding numbers. Always make sure a teacher chaperone is the last to board. I preferred “sandwiching” our kids between teacher and parent chaperones. I was always counting my “ducks” as I began to call them. ENJOY YOUR TRIP! It is very stressful taking a large group of other people’s children off to another state, but well worth it when you have the ability to teach and learn with your students in such an exciting and unique setting. The feedback from the students and parents on my trip is heartwarming encouragement that all the stress is well worth the value of the learning experience! Organization will make you or break you, baby. Stay organized every single step of the way. Spreadsheets for fundraiser tracking, Google forms for questionnaires, binders with multi-tabbed table of contents, expandable files folders, etc. Communicate well, clearly, and often. Err on the side of OVERcommunicating with your parents. I emailed frequently, updated them periodically throughout the year about their balance, and asked often if they had questions or concerns. I made myself available around the clock via text or email to address any concerns they had. While we were actually traveling to/from and at Disney World, I used a free group texting app called GroupMe. We used it to communicate amongst ourselves numerous times a day, and kept everyone happy, safe, and accounted for. With Disney’s free wifi in the parks, we had no trouble using the app all day without zapping the students’ data plans. From the moment my group arrived at the airport heading to Disney to the moment their parents picked them up on our return, I was constantly on the lookout for teachable moments. Most of my students had never been out of the city and certainly had never flown, so I taught them how to check in for a flight, get through security efficiently, read their boarding pass, find their gate, etc. While we were at each park I would give them different “look-fors,” such as scientific or animal facts while we were at Animal Kingdom or multicultural social and food experiences at Epcot. I also hopped around to spend time with every group at some point on the trip, and loved learning and laughing with the kids! I am an avid social media user, and chose that method for documenting our trip. By being very creative in the angles or zoom levels of your shots and blurring out the edges, you can show details of your trip without violating student privacy. When you return home, write a detailed field trip report and submit that to your supervisors so that they can see what a wonderful and valuable learning experience your students had! Managing dining reservations and FastPass+ reservations with a large group is very tricky. We ended up having enough extra from fundraisers to provide $75 in Disney Dining Dollars for each person, which everyone loved because of the flexibility. We were able to use those at the hotel food court, Downtown Disney, and all restaurants within the parks. Some group members were able to get into some of the places that normally require reservations months in advance (such as Germany's Biergarten, Yak & Yeti, and Be Our Guest). I wouldn't recommend counting on that, but it was a little bit of Disney Magic for those kids! FastPass+ reservations were linked together by hotel rooms, but sometimes the kids didn't necessarily want to spend all day with the same people they were rooming with, so FP+ didn't work well for everyone. For a few smaller groups, though, linking their park ticket to their My Disney Experience app was a breeze, and those people were able to choose FP+ for the whole trip. It varied by person, depending on their circumstances. FastPass+ reservations were a bit of a mess for our group, but it always worked out because it was February and lines were fairly short in every park! There is a way for the trip planner to program EVERYONE'S FP+ ahead of time, but that wasn't a task I wanted to take on. I felt that having the opportunity to make their own choices for certain windows of time was good for the kids and their parents. Walt Disney World has an extensive list of educational programs, ranging from engineering to computer animation to multicultural studies. I selected the “Introduction to Global Citizenship” program and added that in to our day at Epcot. Once you choose your program(s), your assigned Disney rep can help you schedule those. Each program ranges in cost and is built into your group package price. Group rates also mean lower prices on hotel rooms and park ticket packages than normal. We did not purchase a dining package but were able to use some excess money from fundraisers and sponsorships to provide Disney Dining Dollars for each participant. The students and parents appreciated the flexibility with the DD cards, so that is definitely something I would use again. Our facilitators met us at the gate and we were escorted inside before the park opened. The students felt like they were VIPs getting a backstage tour! Only one chaperone is permitted per every five kids, so I and the two other teacher chaperones accompanied the kids. Parents were not thrilled about missing out on this program, but were also secretly grateful for the chance to rest for a few hours. The facilitators led us around to various points in the park, stopping several times to run short activities that involved creativity, critical thinking, hands-on learning, and effective use of technology (devices provided by Disney). I loved hearing the students so eager and engaged in the discussions, and found myself taking pictures/notes furiously on my phone so I wouldn’t forget anything. The facilitators were very good, incorporating multiple learning styles as well as challenging and thought-provoking questions. Our group ended up at the American Pavilion and concluded by analyzing the history of our country as related to various cultures around the world. There were so many things those kids came to understand that they never would in a classroom. Several students shared with me that this trip, and this program specifically, changed them as a student and citizen (in more teenagery words, of course)! I was so impressed with the quality of the educational program that I have decided on future trips I will try to add in at least one additional track. It would be optimal to have one program at each park, though that expense would add up quickly. The most important tip to remember when selecting an educational program is to consider your purpose and your itinerary. It is easier to work programs in at some parks than others, and all is dependent on the number of days you will be able to spend at WDW. I learned so much taking students to Disney World on a field trip, and despite all the stress will definitely do it again!